Yori just wants to go home! If only everyone there he cared about didn’t want to kill him. But, you know, family! I want to throw out a reminder that we’re updating the archive with the reformatted/rewritten pages that will be in our printed Volume 2 book! 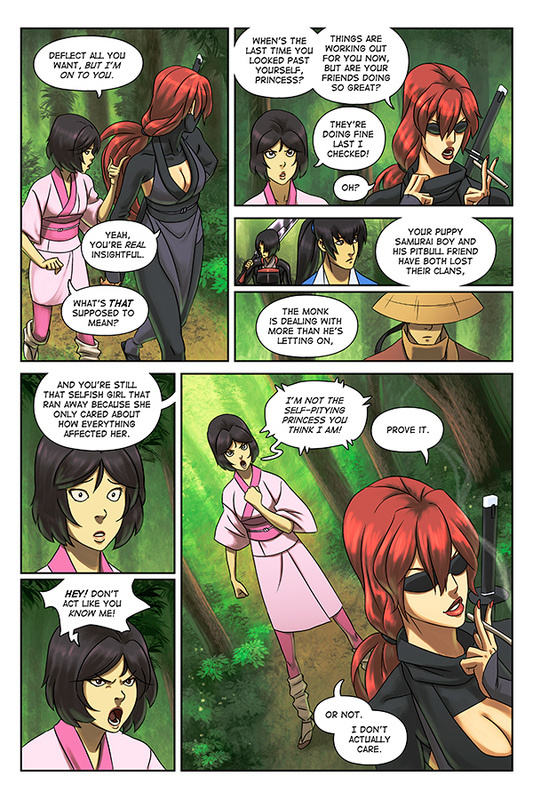 Those new pages start here at page 111, and are currently updated to page 141. 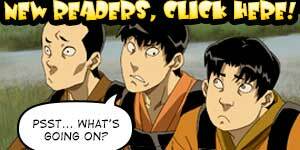 We’ll continue to post new pages to the archive throughout the week, so keep checking back. Since they’ve been so heavily rewritten (for the better), it’s kind of like getting 5 or more updates a day, NICE! Do you wanna have my subplot? It doesn’t have to be *my* subplot. Only now does she realize that her story was a side quest. How bout we put some salt on that burn? There’s that Dignified!Yori, still letting us know that this is a mostly-serious arc…or that Yori has gone though enough character development that the old gags just don’t work on him anymore. …my god. Yori’s become…the strait man. When did THAT happen? I think… about the time he had to confront Ryoku (the blind Demon of Sorrow). I think Yori’s straight-ness has evolved together with the art. Yori tends to go into ‘straight man mode’ whenever he talks about his family. He’s got a very Kenshin-esque goofy/serious personality thing going on. We may actually learn where he gets it from in the not too distant future! I’m guessing a certain one-samurai-army fisherman everyone thinks is dead. First of all, he’s a ninja, not a samurai. Also, unless I missed something, nobody thinks he’s dead, do they? Sooooooo, what about Ina & Yori’s marriage? Are they officially broken up, or is there still a chance? Well, Masuhiro likes Yorikiro well enough, but there’s no political benefit to the marriage at this point, and now they’ve got a lot of stuff going on and I don’t know if this is the appropriate time to be talking about marriage! Marriage to Eijiro, on the other hand, could certainly be of political benefit in shutting down this clan war crisis for good. EIJIRO??? That little punk almost started the war all by himself (with Nataku’s help, of course, but still…). No way, man; Eijiro can just take a long walk off a short pier, if you get my meaning. Oh come one, Eijiro’s plot is foiled. Hirotomo will discipline him, push for the marriage again (which was his idea) and peace will reign… particularly when Masuhiro is assassinated and Eijiro takes control of the Senshin clan. 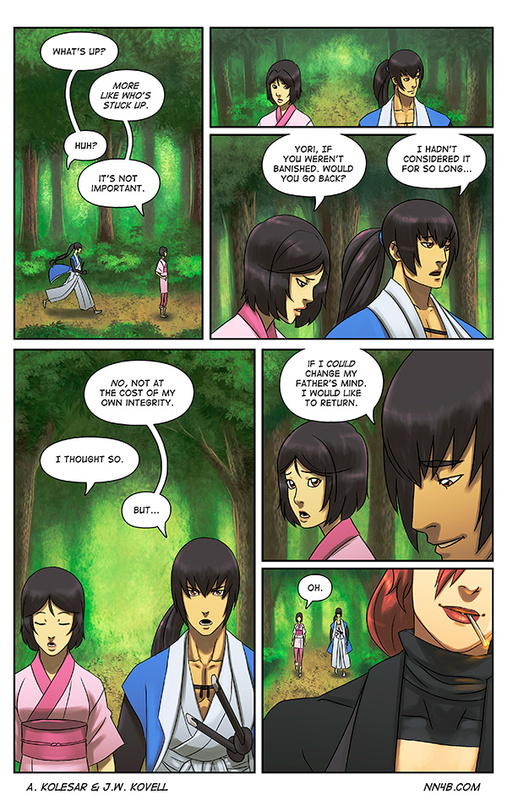 And all they have to do is convince Masuhiro… Yep, the Senshin clan’s survival rests on Masuhiro not being fooled… DOOM! Like I said; Eijiro is all wrong for Ina. Yori is the only man worthy of a woman like Ina. In the end, Ina will be married to Rrrrrricardo! Because he’s the only man worthy of himself. Ricky? Seriously? That gun-running goofball had better keep his grubby paws off the Lady Senshin, or else! Into a lake made out of swords. And by “walk” we mean “Ken throws him”. It is a wonderful idea and I shall do my best! Cho “Destroyer of Worlds”. Because worlds are lame. Hot dogs. Cho will always want hot dogs. In fact, I’m sure the tao told him to stop eating hot dogs, he’d drop the whole monk thing and open a rolling hot dog stand. Ideas For Stretch goals for Vol. 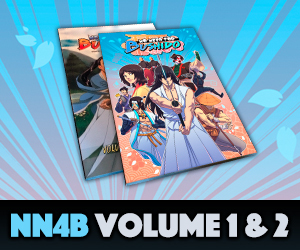 3 KickStarter: at a certain goal maybe the top three up voted comments for each chapter could be put in the volume? AND/OR Alex and Joe Will sing a cover version of one of the Bushido bards from Kung fu klobber? The forest scenery is beautiful. And so is the surprised and hurt look on Ina’s face. Thanks, Ferret! I’ve been trying to build up some new painting techniques that look good and don’t take forever and I think I’m finding a happy medium. that’s a good question! The main cast assembled all in a week, then in week two there was the whole Kyoto fiasco, and then they spent some time getting to the village and rescuing it, which took a couple of weeks, and then some days to travel to the ninja cave, so it’s probably been a little over a month that’s passed in comic time since page 1. Yori left because he didn’t want to have anything to do with the plan to marry Ina and take over the Shenshin clan. Ina ran when she heard of the deal, so Yori had a few days headstart but probably not much more that that. I don’t remember anything suggesting Yori’s been on his own that long. You mean besides the word of god right there? There’s the part about how it’s probably not easy to travel from the clan home of one clan to the clan home of another clan in a few days, especially if it wasn’t really your destination. He left from his house and wandered around until he somehow ended up right in the center of Senshin territory. Yori probably left right after it was finalized and it took a week or two for word of the treaty to reach Misaki, who blabbed about it within a day or two. Why Yori didn’t recognize his mysterious benefactor walking right in front of him? For Lex…I got nuttin’. Sure is a snappy dresser, though. Lex and Matrix may have the ability to be seen by some and not by others at their own convenience. That’s all I intend to say about it! I also want to point out that Matrix gave Yori his new sword, but only indirectly.